There are no registration fees, playing teams to share the court rent & shuttle cost. It is a self organized league, intention is to create a platform for all the Amateur player in the city to play badminton regularly. 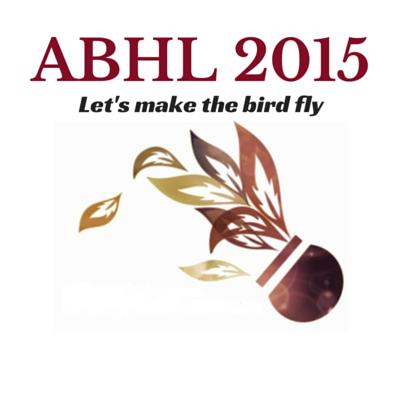 1-All players registering to be a part of ABHL are presumed to be medically fit to play badminton.Any medical emergency arising due to any reason during the course of the games,is the sole responsibility of the players themselves.The courts booked by the players themselves may or may not have basic first aid facilities. 3-ABHL2015 is NOT a commercial venture of any sorts.All expenses relating to court rentals,shuttlecocks and any other allied expenses are all shared equally between all the playing members.Shuttlecocks are not provided by anyone and have to be sourced by individual players for their own games.In the same manner,there are NO cash prizes being offered or any other prize of any nature. 4-An integrated tracker has been built and maintained by various members of the ABHL community and it is the responsibility of the individual members to keep the tracker updated. 5-A framework of rules and guidelines have been drawn by all the playing members via mutual discussions and the league is run on the basis of this set of guidelines.This is in place to ensure a fair conduct of the matches. 6-On match days,players are expected to call up their opponents directly for any co-ordination related issues.There are no \"organisers\" available for the players to call. 7-Court booking responsibilities may be taken up by a set of individual players \"voluntarily\"This set of players are not to be considered as ABHL2015 organisers.They are only facilitating the smooth conduct of the games and thereby assisting fellow players by acting as Single Point of Contact. Amateur Badminton Hyderabad League (ABHL) kicked off on Aug 2015 and is going strong with 60+ teams (Doubles only - Gender Neutral). It is played in round robin format in the weekends mostly and the league is designed in such a way that New Entries can join at any point of time(more details in the below FB link). The ties are played mostly at RRC (Secunderabad), Lalapet, SR Sports (Banjara Hills) & PJR (Chandanagar). To register teams need to mention their Names (Your Name & Partner) & Contact details on the below Facebook page. 6-On match days,players are expected to call up their opponents directly for any co-ordination related issues.There are no "organisers" available for the players to call. 7-Court booking responsibilities may be taken up by a set of individual players "voluntarily"This set of players are not to be considered as ABHL2015 organisers.They are only facilitating the smooth conduct of the games and thereby assisting fellow players by acting as Single Point of Contact.